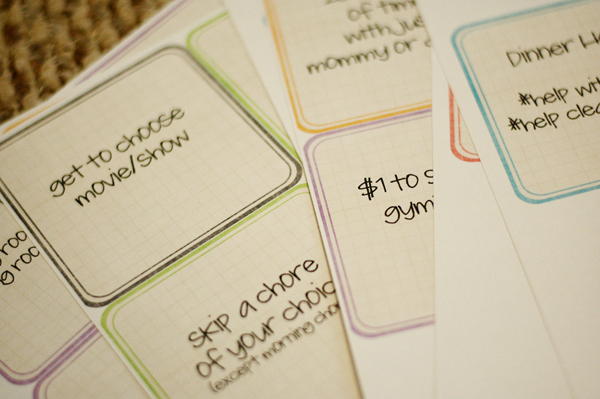 I've been wanting to have a more organized way of keeping track of my kids' chores. They have chores they do, but I feel like I'm constantly reminding them of what they have to do and then I forget sometimes what I've already told them to do. It was time for a much-needed adjustment to our chores. 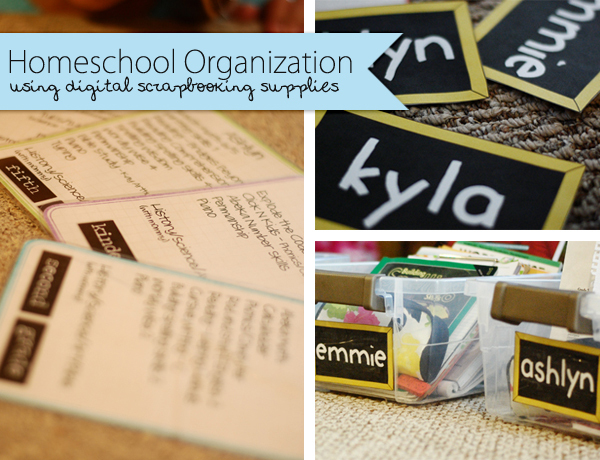 So, being a digital scrapbooker, I decided I should use some of my digital scrapbooking supplies to make some kind of chore organizational system. 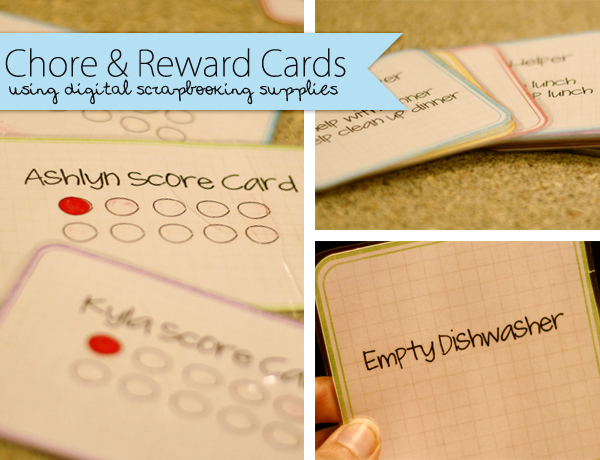 I had these Journal Cards from Tracie Stroud and I thought they would work perfectly for using as chore cards. 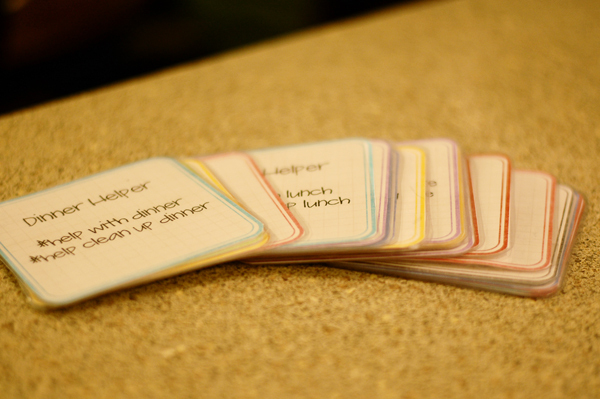 I brought them into photoshop and typed in different chores on the cards and rewards on some of the others. Then I put the cards on 8.5x11size pages in photoshop, saved them as .jpgs and printed them out on my home computer. 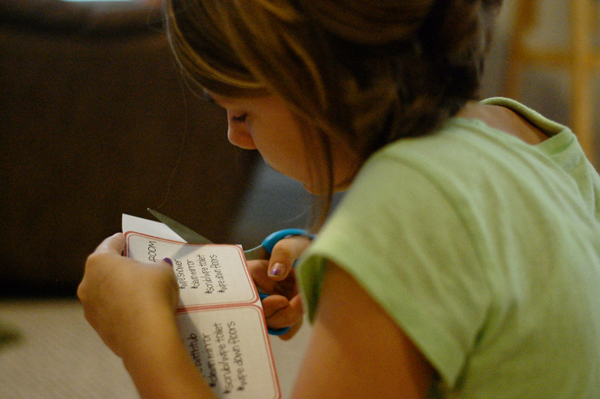 Then I put my daughter to work cutting them out for me. 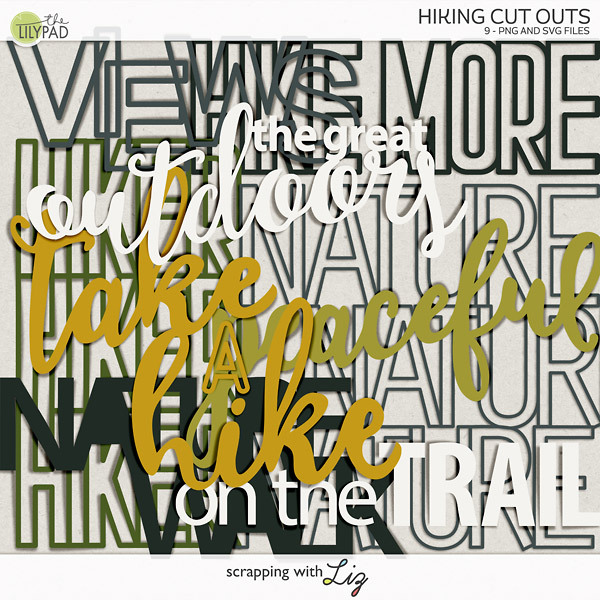 ;) Besides, she actually likes cutting, unlike myself, who prefers cutting with my keyboard. 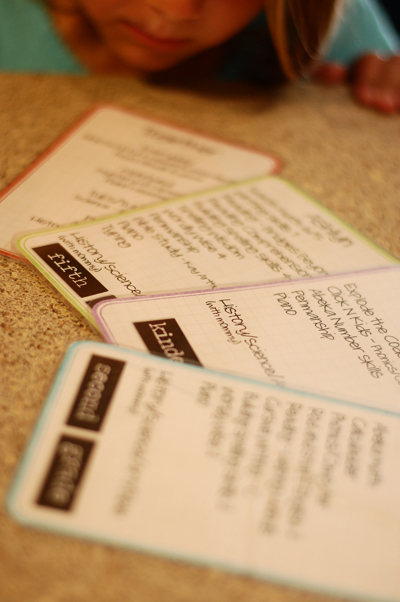 Then I laminated them all and now I have handy dandy chore cards that I can give my kids every morning. What I've been doing is giving them each a couple of cards in the morning and by the end of the day, they have to have them done. 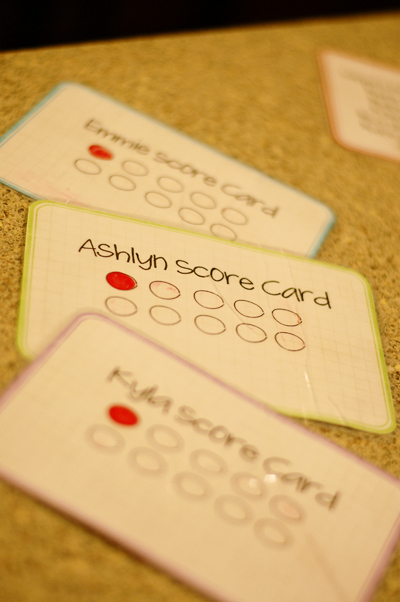 I also made these scorecards to keep track of when they complete a chore. For each chore completed they get to fill in a circle with a dry erase marker. When their cards are full they get to randomly pick a reward card. So far it's given them great motivation for filling up their cards and I'm getting a lot of work done around the house! - Care for Lucy: Check her food and litter box. While I was at it I decided to get my school stuff organized for next fall too. This is what I do in the summer: I get all organized because I have no time the rest of the year to do these kinds of projects! 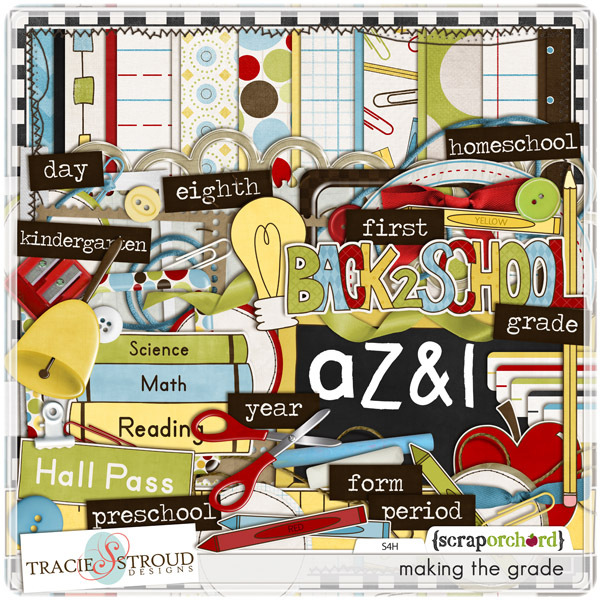 I took this kit from Tracie Stroud to help myself get all ready for the 2012-2013 school year. I took the chalkboard in the kit and took the alpha to 'write' the girls' names on it. Then I printed them out on my home printer and taped them onto individual plastic containers. Each of the girls gets a box and they will have the school work they have to get done for that day in it (along with other supplies they might need - pencils, scissors, glue, etc...). Last year my 9 and 7-year-old carried their school work all around the house in different rooms to complete it. 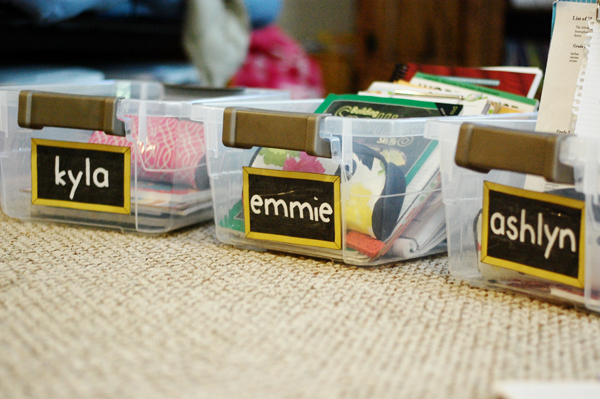 I thought this would be an easy way for them to carry their schoolwork around and be able to keep track of it all. They were continually losing things. Coincidence? I think not! Now there will be no more excuses. 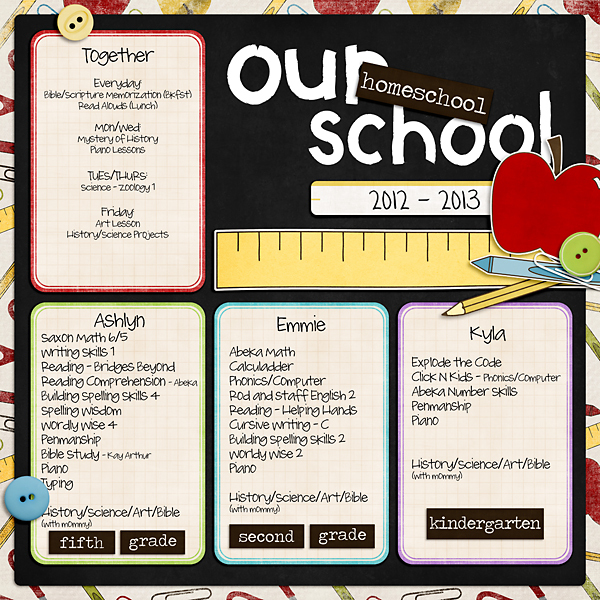 Then I used those journal cards & kit again and typed up a list of the different subjects the girls are working on. I'm going to stick these in each of the boxes so that I can keep track of what they are doing and what they need to get done every week. And then since I had these cards all organized with our list of schoolwork I thought I should scrapbook them. Won't it be fun to look back and see what we did during this school year? 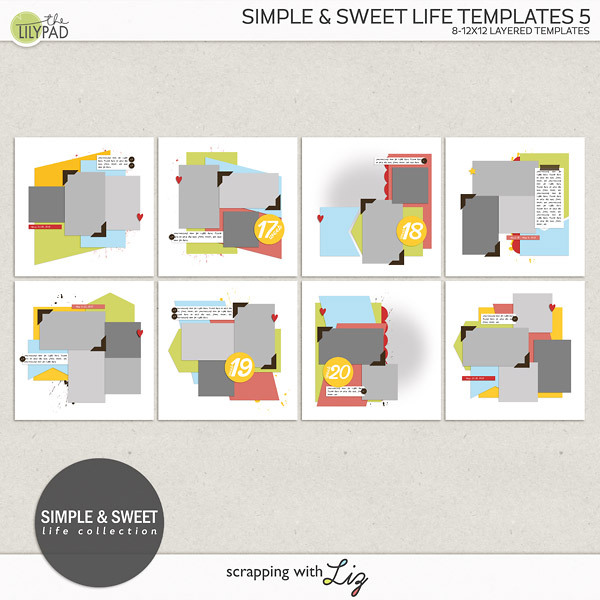 I hope that gives you a little inspiration to use your digital scrapbooking products for organizational projects. It makes it so much more fun. THIS was very helpful! Thanks you!!! LOVE these! Those boxes will help a lot, I can testify to that! What font are you using on your cards? I really like it! It's called Elizabeth Skinny....no relation to me! LOL!